Good line drawing is the basis of art. Simply put, drawing is the practise of putting lines on paper, but there is more to it than meets the eye! The importance of learning to create expressive contour lines is something I can not emphasize enough. Let's look at some examples. 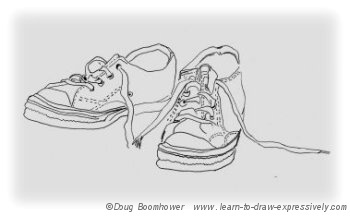 This is a drawing of an old pair of my running shoes, which I drew many years ago. 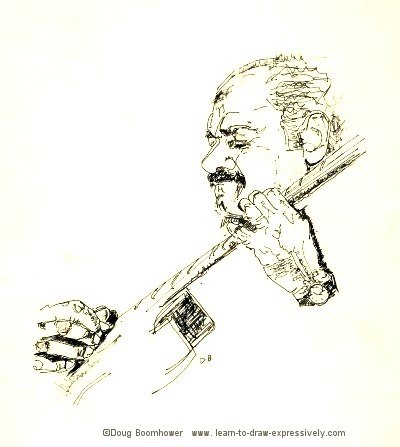 I used this drawing as a study in the use of line. There is no shading in the drawing but notice that just the lines alone can convey the three-dimensional quality of the shoes. This is a contour line drawing. It shows the expressiveness of a contour line. 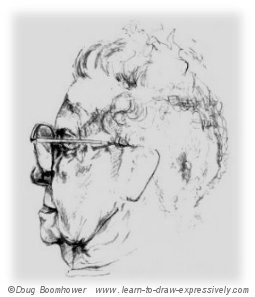 All of the portraits seen here are examples of what you can create just with contour lines. 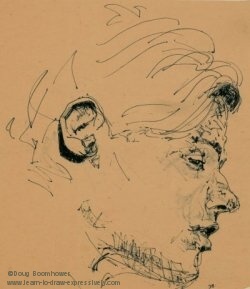 All of these drawings were done confidently and quickly, which accounts for their expressiveness. 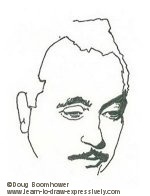 Notice the very few lines used to capture the likeness and the expression of legendary guitarist, Django Reinhardt. The irony is that simplicity like this is difficult to do until you have practised using contour lines. Here, I have captured the essence of the portrait by drawing only the most important lines, and leaving out the rest. It is an important first step that you reduce your subject to its basic essence. This accounts for the number of preliminary drawings I do before embarking on a major project. 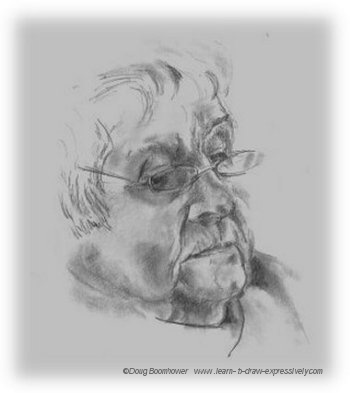 The preliminary drawings are a search for the essence of your subject. Once you have captured that basic essence of your subject, it then becomes the foundation on which you proceed. 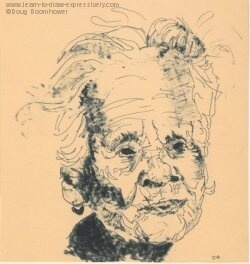 On the other hand, notice the number of lines used in this drawing of an elderly woman. As in the drawing above, I captured the essence of the subject, and then elaborated it with more lines. 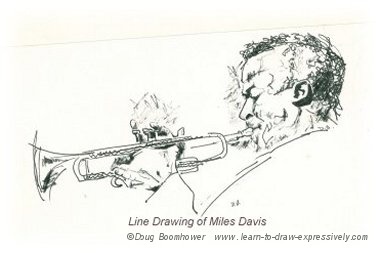 You will notice darkened areas in some drawings, but all of the drawings rely predominantly on lines. 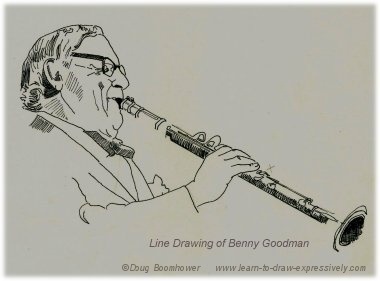 The essence of Benny Goodman is caught with a few contour lines. Mrs. Cunningham was an acquaintance. I quickly drew her while she watched TV. Although it is predominantly a contour line drawing, we begin to see the introduction of shading around the eye, nose, and lower cheek. The same can be said of Ruth, another acquaintance who sat for me. They were each done quickly (less than one half hour). 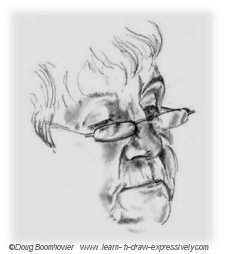 This drawing of Ruth is starting to introduce shading, even more so than Mrs. Cunningham above. Capturing the likeness of my models is always my first concern, and for me, that likeness has to go hand in hand with expressiveness. Learning how to use contour lines and gesture lines is the key to creating expressive line art drawings.